Flying through the XDF in 3-D. Movie credit: hubblesite.org. 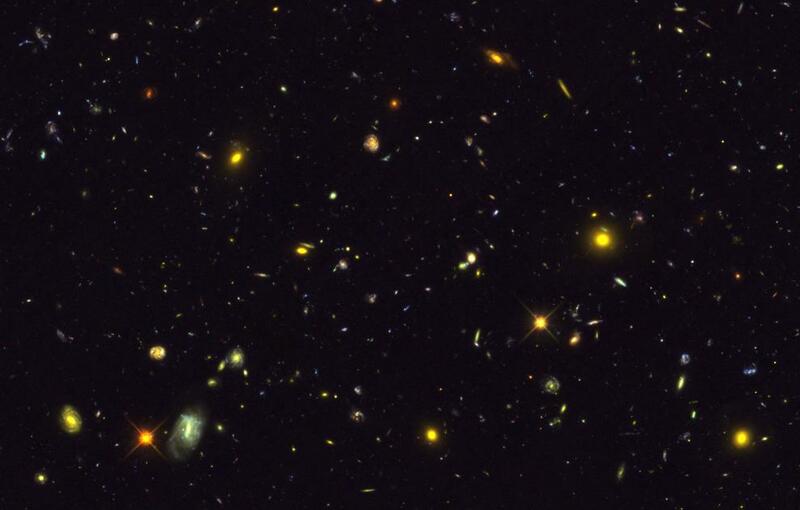 The eXtreme Deep Field (XDF) project created the deepest image yet taken of our Universe by combining over a decade of Hubble data in fields surrounding the original Hubble Ultra-Deep Field, resulting in a total integration time of 1.8 million seconds (more than 20 days!) Optical (ACS/WFC) and near-IR (WFC3/IR) images were drizzled down to two different image scales: ACS data at a high-res (30 mas) scale, and both ACS and WFC3 at a low-res (60 mas) scale. Users may download the science images for each filter, and the corresponding weight maps, as FITS files at the MAST XDF page. This page also explains how the XDF was created using past HST data, lists which program IDs went into it, and provides zero-points for converting the fluxes from electrons/second to AB magnitudes. Example 3-color XDF image created by adjusting Interactive Display contrasts. Of particular interest may be our XDF Interactive Displays, which allow you to pan, zoom, adjust contrast, and overlay sources from the SDSS, 2MASS, GSC2, FIRST, and/or GALEX catalogs. You may click on any of these overlaid sources to bring up that catalog's data for it. In addition to the individual filter mosaics, we provide three-color images (f850lp+f775w+f435w for ACS, f160w+f125w+f105w for WFC3). You may save your display as a JPG by pressing the Save icon towards the top right of the page, but note that this will remove all icons and overlaid sources on screen from the resulting JPG. To retain those, use your computer's Screen Capture functionality instead. An example of a saved image using the 30mas ACS composite is shown to the right. We expect the Interactive Display and source catalog overlays to aid users when identifying interesting objects for further study.